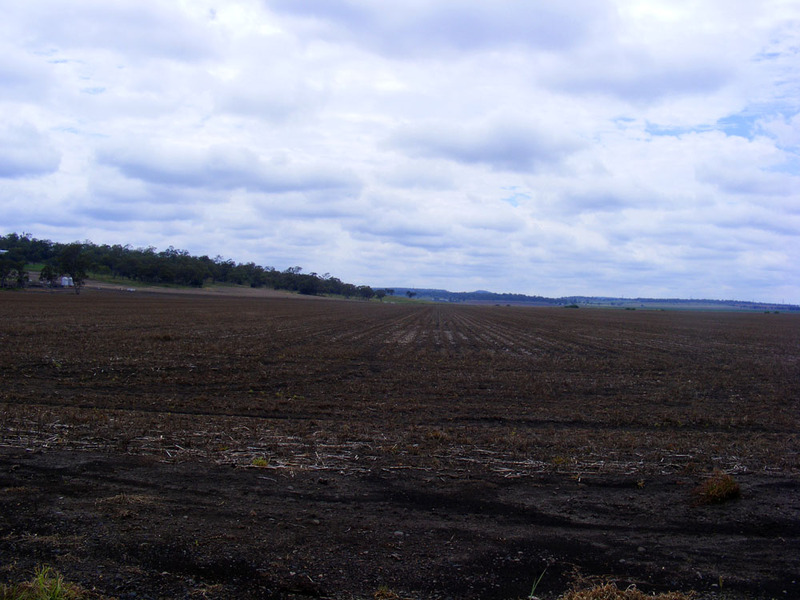 The fertile black soil plains of the Darling Downs were named by the explorer Allan Cunningham in 1827, after the then governor of New South Wales. The crops grown in this soil include soy beans, chick peas, cotton, wheat, barley and sorghum. This is the area in Australia where I lived for many years. The area produces one quarter of all the agricultural output of the state of Queensland. The soil is the largest area of rich heavy cracking clay (basaltic alluvium) suitable for agriculture in Australia but much of the land is also both drought and flood prone. The climate is sub-tropical, with average rainfall about 800 mm per annum. The summer temperatures regularly hit the low 40s these days and winter lows can be in the low minuses (with frost and occasional very light snow). Before white settlement the aboriginals managed the lush natural grasslands here with fire. 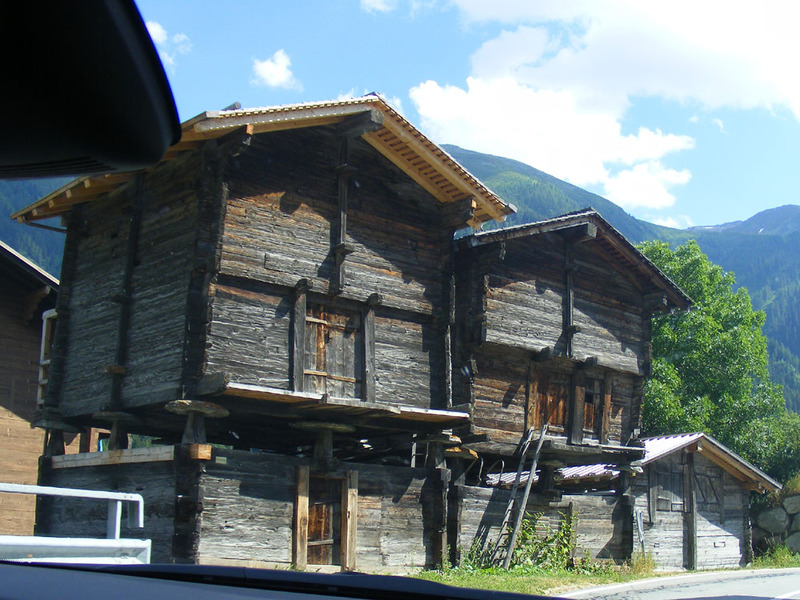 I photographed these traditional alpine barns in Switzerland from the car on our way home. They sit raised up on staddle stones to keep the contents of the building (traditionally hay or grain) dry and rodent free. Access is by ladder, which in the old days would have been carefully removed to prevents rats using it as a climbing frame. Underneath there is space to keep livestock, usually a few cows. My friend Carolyn runs a swift conservation charity in Amboise so when she heard that I was involved in the restoration of the Chapelle de Tous les Saints in Preuilly she immediately reminded me that it was an opportunity to get some swift nest boxes installed. What the nest boxes and ventilation tiles used as entries look like. Photo courtesy of J-P Barthel. I broached the subject with the architect, the local history society (who were managing the funding) and the local council (who are the owners of the building). The first hurdle was establishing who would pay for them. The architect was completely open to installing them as part of the project, but needed to know if there was funding. Luckily my friend Alain offered to at least partially cover the cost, in memory of his mother, who always recorded the dates of the swifts arrival and departure over many years. The rest was covered by the local council. Nest box in place behind the battens, with the membrane in place. 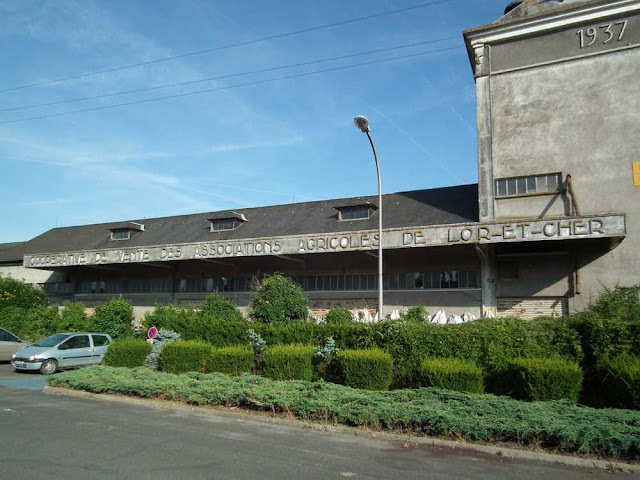 The next hurdle was getting French language technical information and specifications to the architect and roofers. Luckily, a Swiss swift conservation organisation had published a great instruction manual for builders, homeowners and architects, in French, which Carolyn sent on to our architect. In the end, after a bit of angsting about where to buy ready made boxes (which were rather expensive if sourced in France) the carpenter made boxes and between them the architect and the roofers came up with their own ingenious solution. Swift nest boxes in place just before the tiles go back on. They made nestboxes which sit behind the batons on the roof and prevent the possibility of the birds accessing the whole roof area (with its precious, newly conserved oak vaulted ceiling). To provide access to the outside the entrance to the nest boxes is a traditional terracotta ventilation tile, in a sort of upturned cup shape. 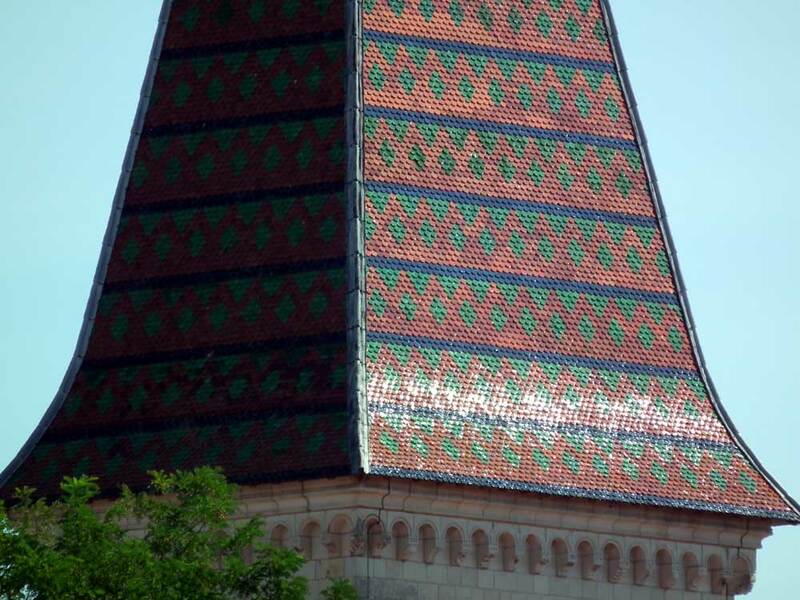 The real ventilation for the roof is provided by copper slips that replace tiles every now and then across the roof, resulting in a little gap that is covered with a grill to prevent any undesirable creatures getting in. The entrances to two of the new swift nests. Carolyn and I are really pleased that the suggestion to add nest boxes was well received. That's one more architect and one more roofing firm educated about how they can help a species that is in decline. It's too early to tell if the swifts will like our new condo, but we'll be watching what happens next year. Nest placement isn't an exact science and they may decide they don't like being south facing (maybe a bit warm) or the nest boxes may be occupied by sparrows or another species before the swifts get back from their winter in Africa. This happens a lot, but apparently, if they really like a site, swifts are quite capable of evicting sparrows. 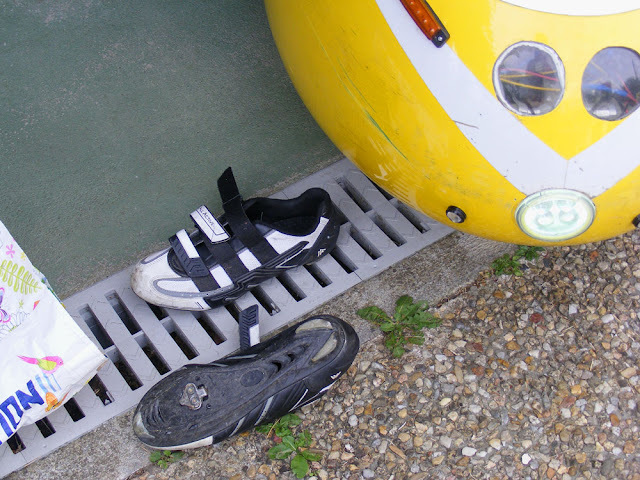 If not, a simple modification to reduce the entry hole size might be in order. 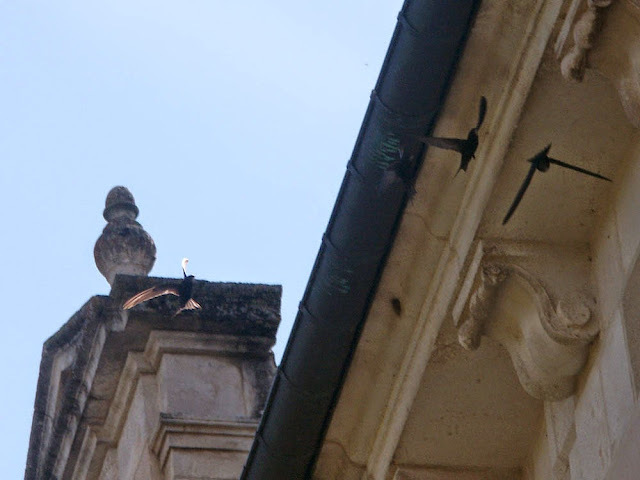 Swifts nesting in the Logis Royal in Loches -- this is what we are hoping for. 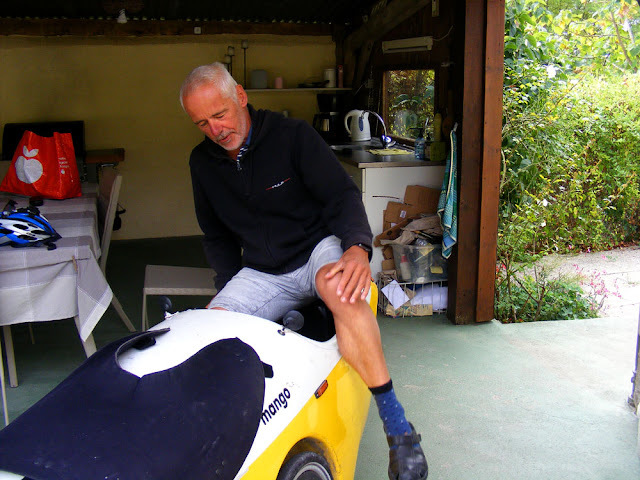 Our Dutch friend Huub is very sporty and this year he has transitioned into semi-retirement from his professorship in biomechanics at the University of Amsterdam. He decided to buy a second-hand velomobile, modify it to suit himself and set off in it from home in the Netherlands to his holiday home near Yzeures-sur-Creuse. He was accompanied by his friend Rob, riding a top of the line carbon fibre road bike. A plastic lunch box tidies up Huub's various electronic additions. The journey was planned using online maps for cyclists and they covered the 900 kilometres in about 10 days, staying in cheap hotels every night. Even Huub can't make it look easy to get in and out of. 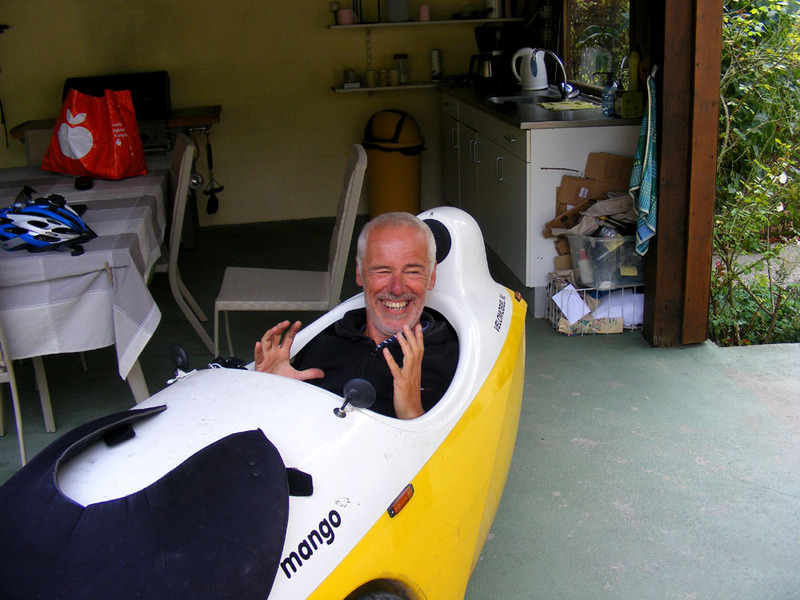 The velomobile is a model called the Mango and Huub, who freely admits he's not really a cyclist, loves it. 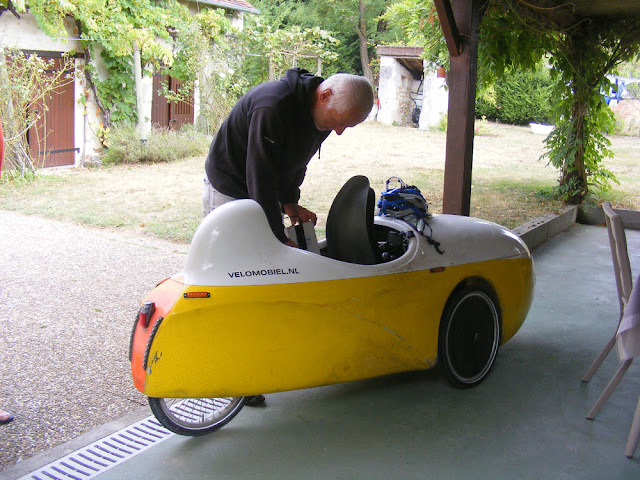 He used it extensively while he was here, to run errands and just to tour about, doing circuits between 30 and 90 kilometres to see the sights. You can read about the Mango and its delights on the manufacturer's website. You ride clipped in to the pedals with your shoes, just like a racing bike. 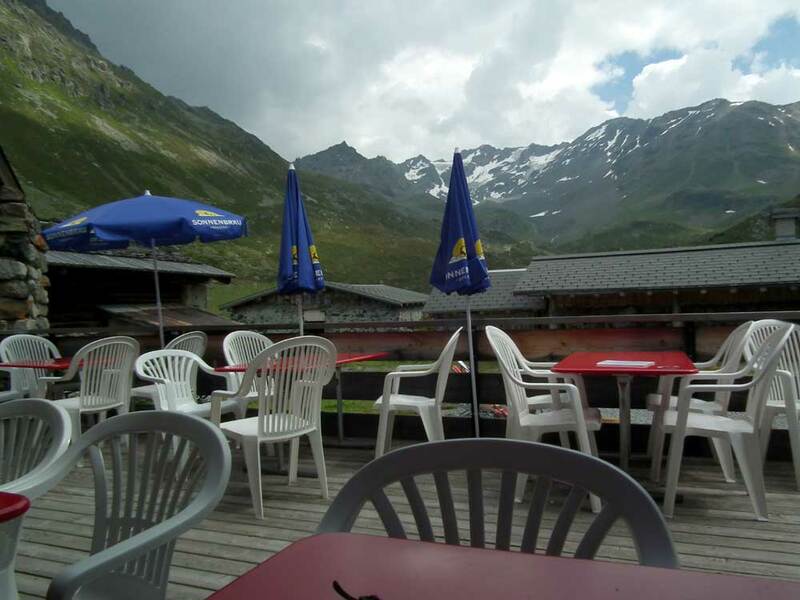 We saw the board in a couple of bars in Switzerland and wondered. Guesses included some sort of tab system, somewhere you keep a hotel's room keys, or a something else less defined. But now we know. A Cagnotte is like a Christmas club, but it's not restricted to Christmas. A group is formed which agrees on a monthly donation, and at the end of the year a party is held using the money. 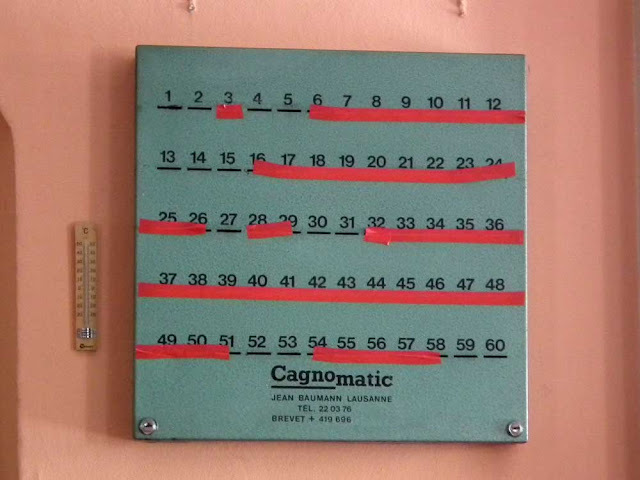 The Cagnomatic is a device for making it easier to collect the money - members put the agreed amount through their slot, and the bar owner (or maybe the responsible club member) banks the money to be used for the party. 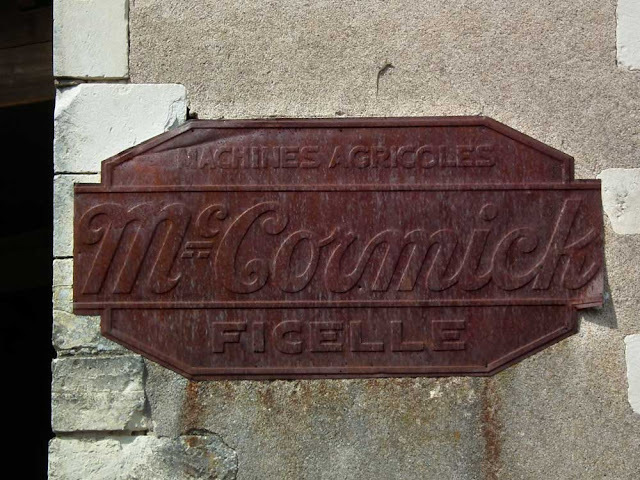 It appears that cagnottes started to happen at the start of the 20th century. These days there are many places where you can start one online, but they appear to be more along the line of crowdfunding. 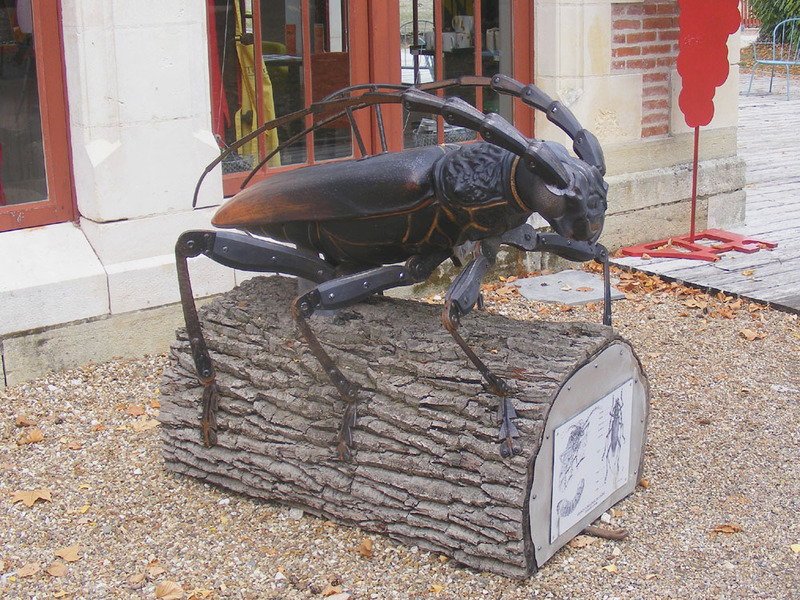 As far as I can tell, in France you can call a piggybank you're using for a particular purpose a cagnotte, as well. This Cagnomatic was photographed in the Bar Centrale in Grono, a village near Bellinzona, close to the Italian border. The waitress spoke only Italian, but the veal they served was properly good. And yes - it's that pink! ...in the right place, it's amazing. Hence, I would love to be the owner of this sign. Last week we didn't cover a lot of ground. We did manage to go swimming on Monday with Huub, so that's 1000 metres of pool activity, but the rest of the week we were working. In total I managed 18km of walking. The good news is that it was all at a faster pace than previously. I'm still not sure how we will manage at an altitude of 2700 metres when the highest point in any of our walks so far has been 130 metres, but I guess we will cross that alp when we get to it. Over the last couple of years the City of Tours has been quietly working to restore the exterior of the little known Chateau of Candé. They've also been improving the grounds with additions of statuary, opening up vistas and running a series of events, many of them gourmet food oriented. Inside several new rooms have been refurbished. Hidden away in the basement is a humungeous new heating and climate control system worthy of former owner Charles Bedaux. The temporary exhibition at the moment is some of Wallis Simpson's furniture from the apartment in Paris that she shared with the Duke of Windsor and their assorted pet pug dogs. 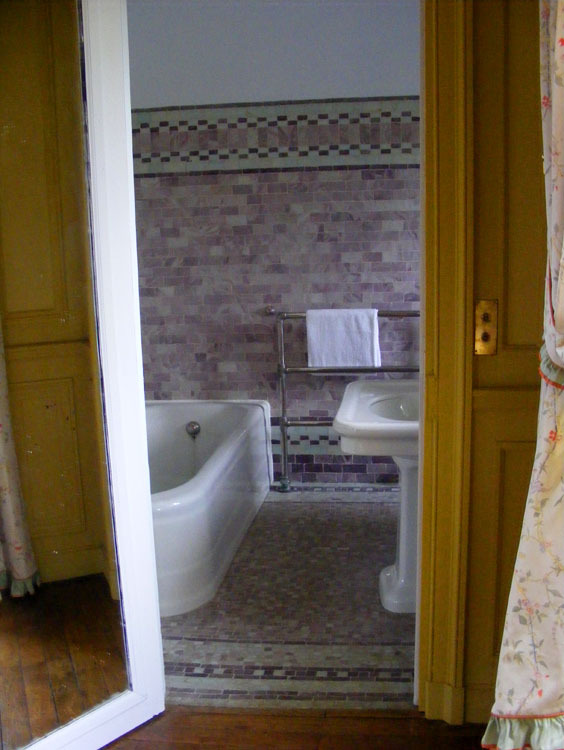 A newly restored guest bathroom. A mechanical ride for kids in the form of a Great Capricorn Beetle. 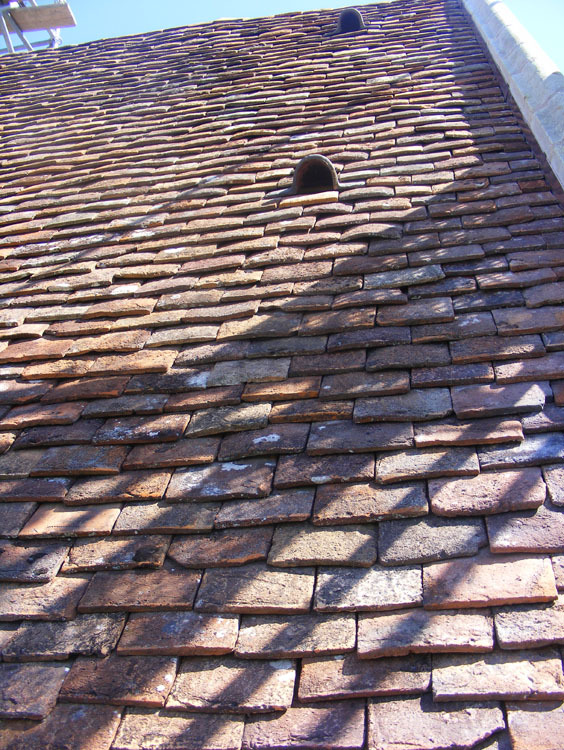 The reroofed and newly cleaned exterior of the 19th century wing. 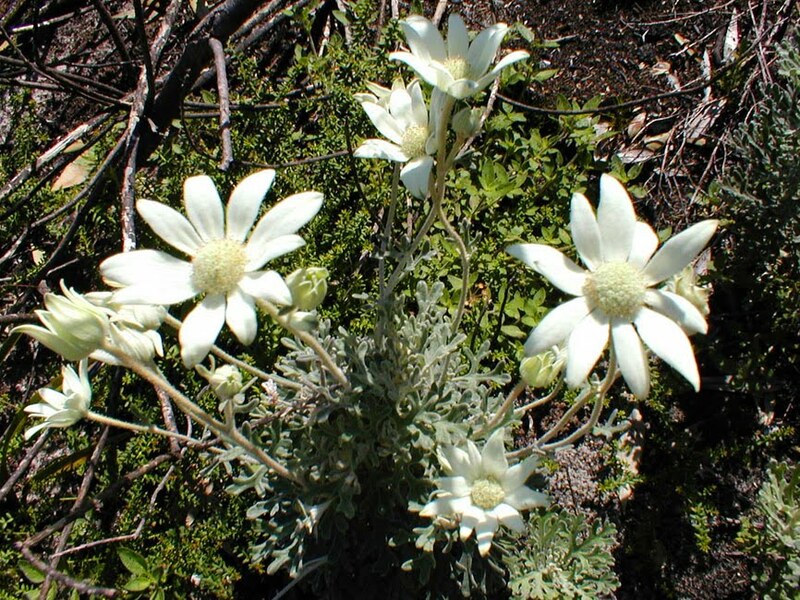 I may be partial but a good Flannel Flower Actinotus helianthi beats Edelweiss Leontopodium nivale hands down. 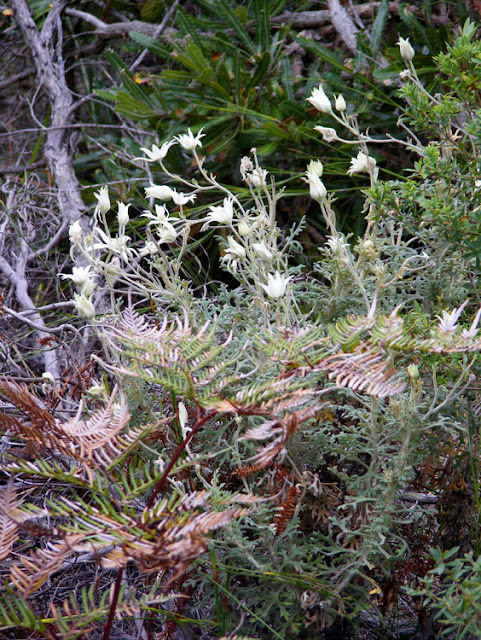 It's a lot easier to see in the wild too, being a coastal plant growing in sandy heath around Sydney in abundance rather than an alpine that you have to go off the beaten track for and climb to two or three thousand metres up rocky limestone in Switzerland, France, and Austria. 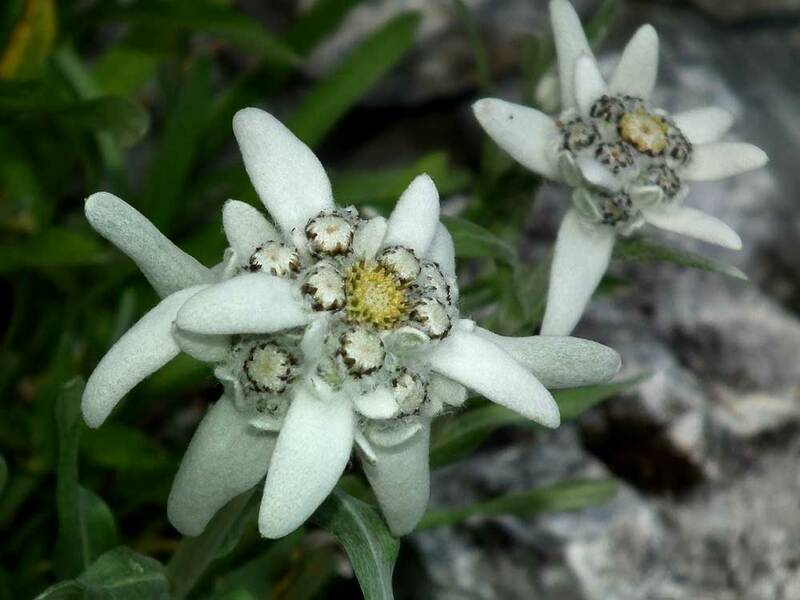 Although they superficially resemble one another they come from different botanical families (Flannel Flowers are related to carrots, Edelweiss are daisies). Several years ago our friend Jill gave us assorted tiny, one leaved cyclamen seedlings. 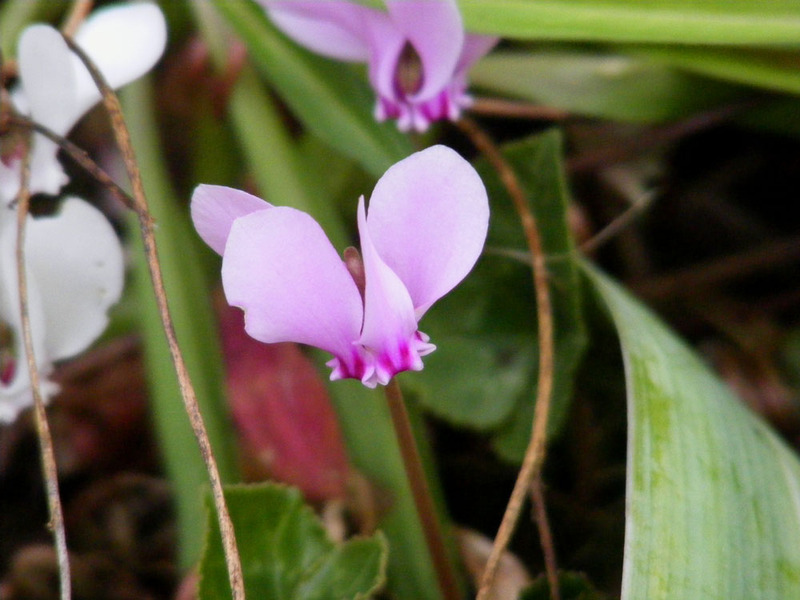 A few of them flower in the spring and are Cyclamen coum. Most however are C. hederafolium and flower at this time of year. 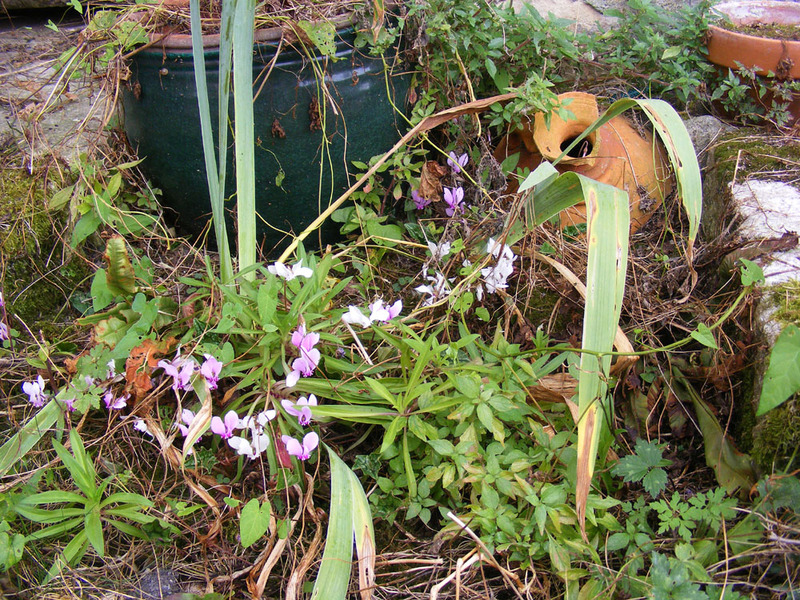 So for our annual autumn cyclamen flower post, here is a little, untidy corner of our garden. The weekend just gone was Heritage Open Weekend (Journées du patrimoine) and as part of it the Chapelle de tous les saints in Preuilly was open to visitors. 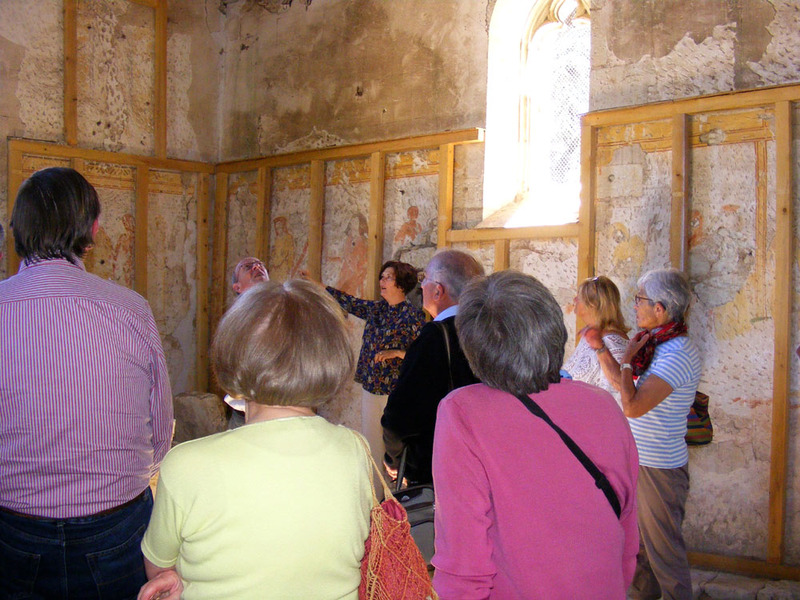 On the Saturday the two wall paintings conservators gave presentations inside the chapel to tell people about their work there. Sabine de Freitas did the morning presentation, talking primarily about the iconography of the decoration, including the painted oak vault that has been conserved and the danse macabre on the interior walls that we have yet to raise the funds to conserve. Corinne presenting the conservation work to the public. I went down for the afternoon session, presented by Corinne Tual. This was much more technical information about the materials used, both originally and to effect the stabilisation and restoration of the paintings. 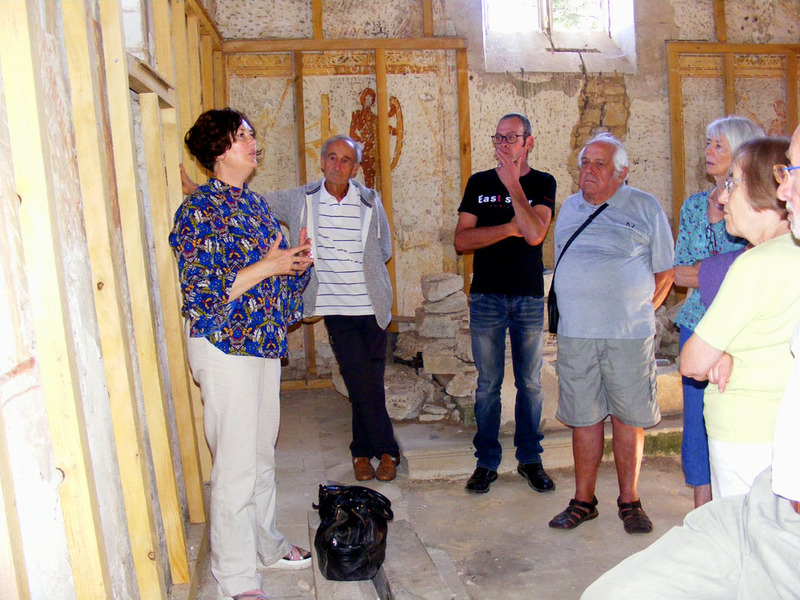 There was quite a lot of chemistry as Corinne told the twenty or so assembled in the little chapel about the types of pigments used and how lime in various guises is used to repair gaps and holes. In typical fashion for the era c. 1500 the main pigments are red and yellow ochre, which can additionally be mixed with each other to produce orange, or with the lime to produce pink. She made the point, as professional wall paintings conservators always do, that our chapel is not decorated with frescoes, but with with wall paintings ie, painted on dry plaster, not wet, and therefore less well adhered to the walls. All painted wall decoration of the 15th and 16th centuries in this area is painted on dry plaster. No one is sure why local artists switched from mostly working in the true fresco technique in the 12th and 13th centuries to exclusively painting on dry walls a couple of centuries later. 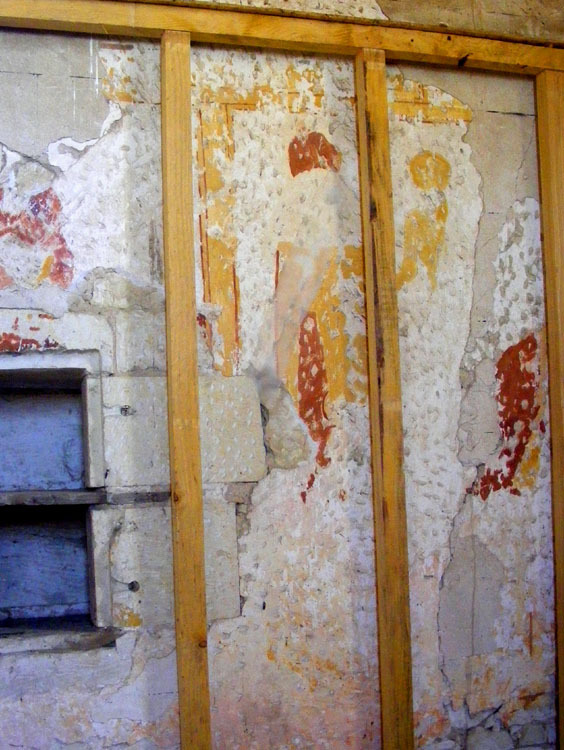 Perhaps the techniques of true fresco were lost, but that seems unlikely, and fresco reappears in the 17th and 18th centuries. 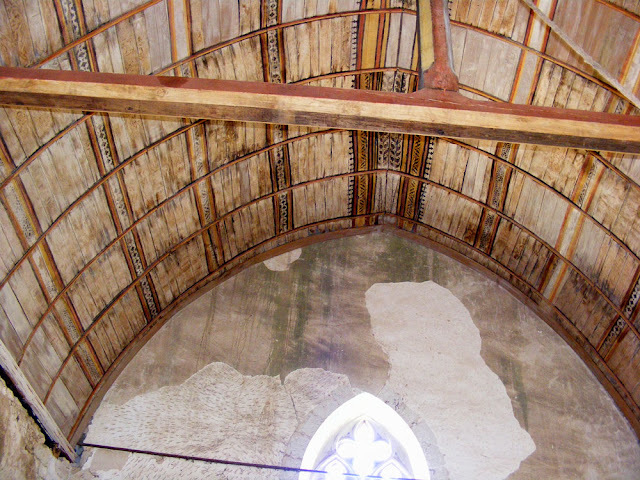 Even with conservation the old water damage to the vault is obvious. For the moment the danse macabre has been gently dusted and any really fragile bits have been covered with Japanese paper. Later, once funds have been raised, these areas will be injected with a glue made from casein that will bind to lime. Importantly, this process is reversible, so that if a better technique is developed it can be applied without risk to the artefact. Japanese paper holding a portion of wall painting on. For now we don't have the funds to conserve the danse macabre any further, but it is protected and can sit as it is indefinitely. Corinne says that it is a couple of months work to conserve once the funds are available. So if you would like to donate to the cause, please get in touch and we will let you know how you can currently contribute. There is a small funicular railway from Davos called the Schatzalpbahn which climbs 300metres to the hotel, restaurant and alpine botanic gardens of Schatzalp. 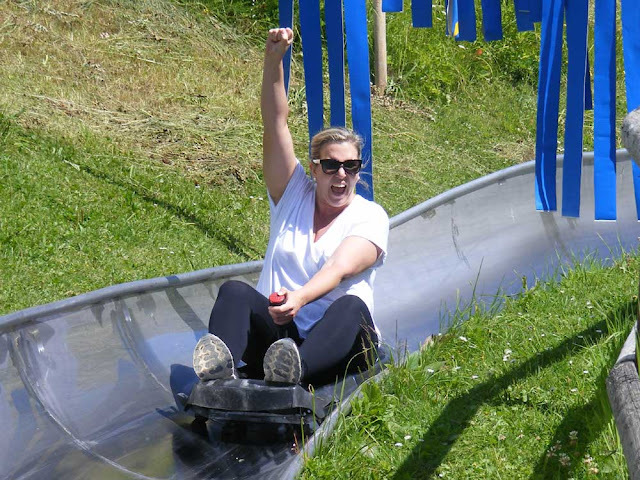 There is also a summer sledging run. 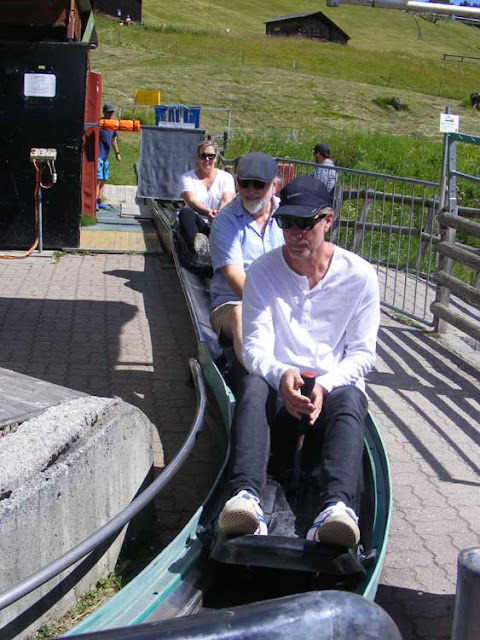 This is one of the few things we did that actually cost us money - every other day in Switzerland was filled with Davos-Klosters Card fun. 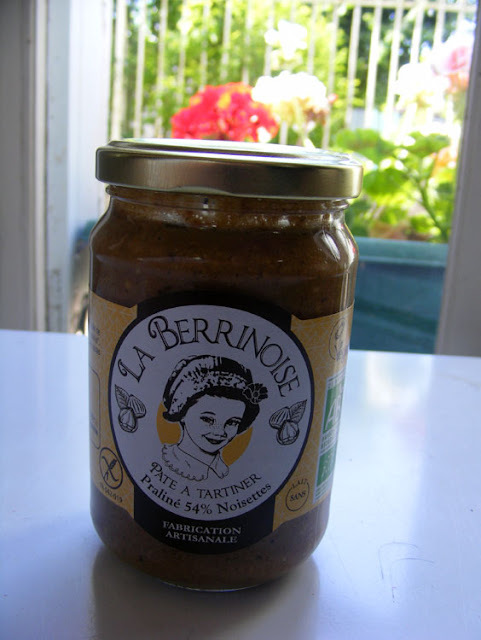 Have you bought a jar of nut butter and find you don't really like it spread on bread? Here is a much nicer way of using such a product. Carefully brown the ground almonds or hazelnuts in a pan. Combine the ingredients for the coating. Put the rolled oats in a food processor and pulse a bit. Combine the nut butter, honey and vanilla. Add the rolled oats and cocoa nibs to the nut butter mix. Stir until combined and forming a paste. 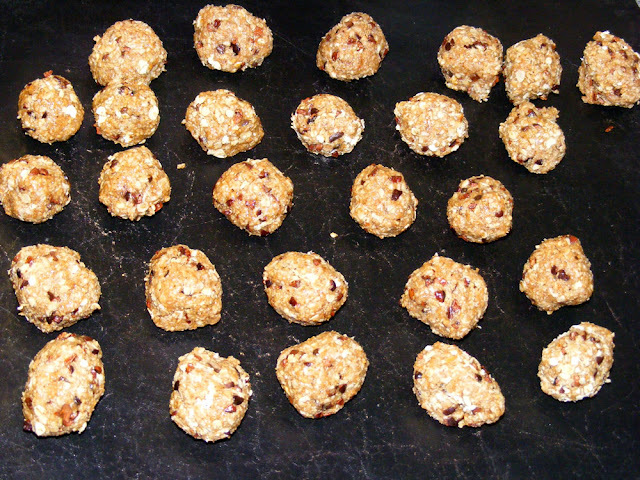 Make about 30 small balls from the paste. Roll the balls in the coating once and then repeat the process. Arrange in a single layer and refrigerate or freeze. The truffles ready to be coated. If you live around the Preuilly area you can buy the hazelnut butter and honey from Sylvain at La Croisée des Terroirs, our specialist local products grocer. 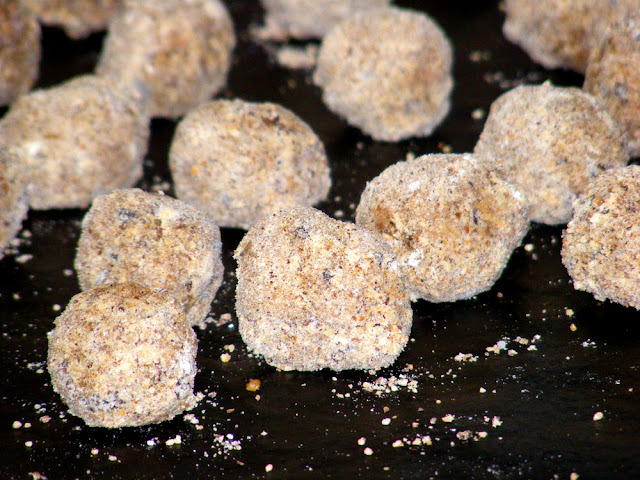 The finished hazelnut truffles, coated in almond sugar. Last week there was no swimming at all, and three days work away from home interrupted training, but we still managed 33km of walking, most of it at about 6km/hour, even when we weren't trying really hard. Some of the morning walks have been a lot cooler, which may account for the higher speed. 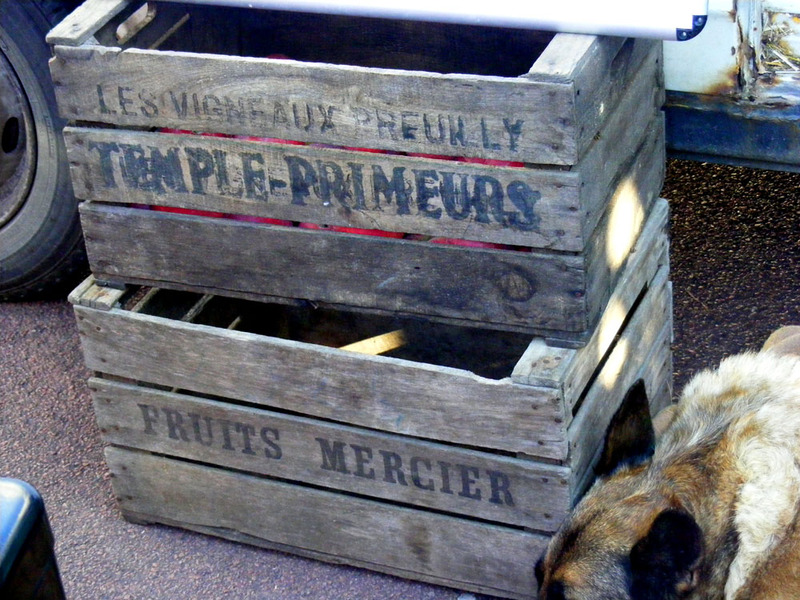 The other day at the market in Preuilly I noticed that Tony the Organic Orchardist had some nice old fruit boxes by his van. They had the names of long gone businesses stencilled on them and I asked him what their history was. He said he 'inherited' them when he bought the orchard. 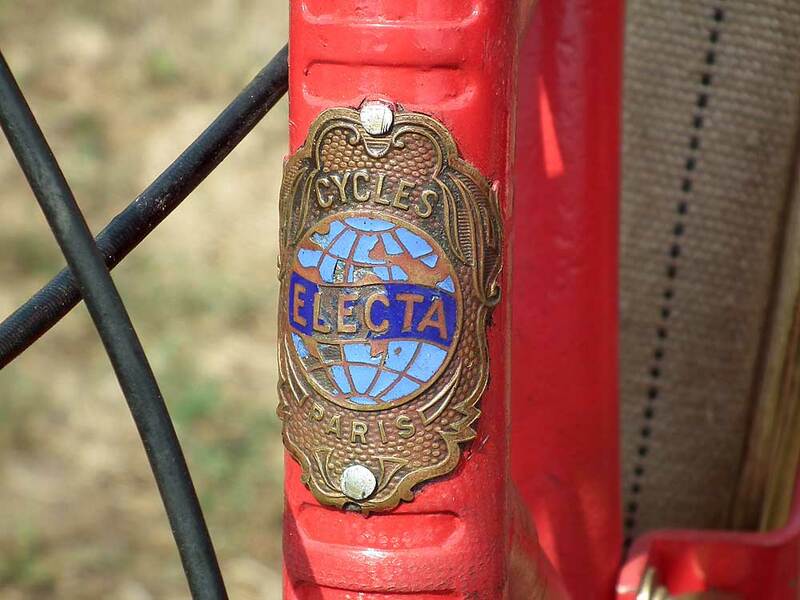 They date from the 1950s and 60s and he has lovingly repaired them so he can continue to use them. 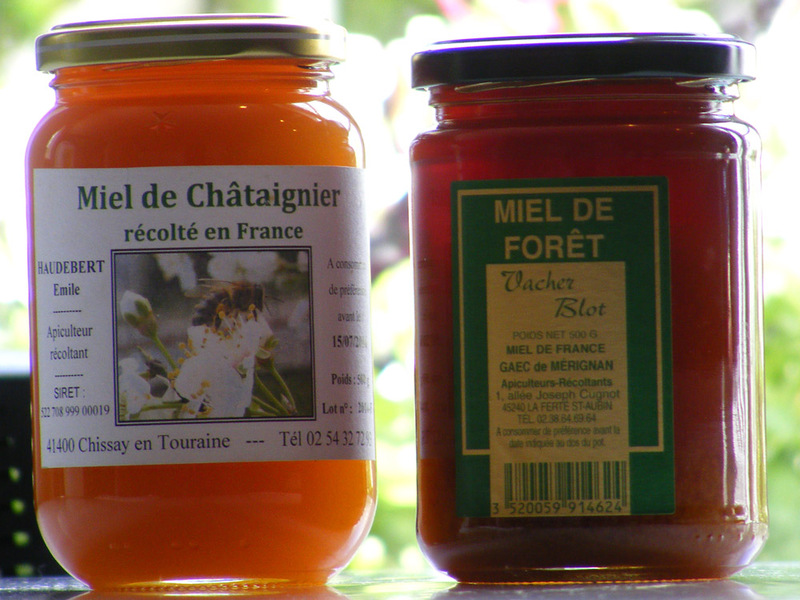 He likes the idea of them being in continuous use for more than half a century, and by three different owners of the orchard. So often fruit boxes are used as kindling here and I was charmed by how sentimental Tony was about these seemingly mundane objects. Cotter Dam is about 20km west of Canberra, and until the 1960's was the source of Canberra's drinking water. 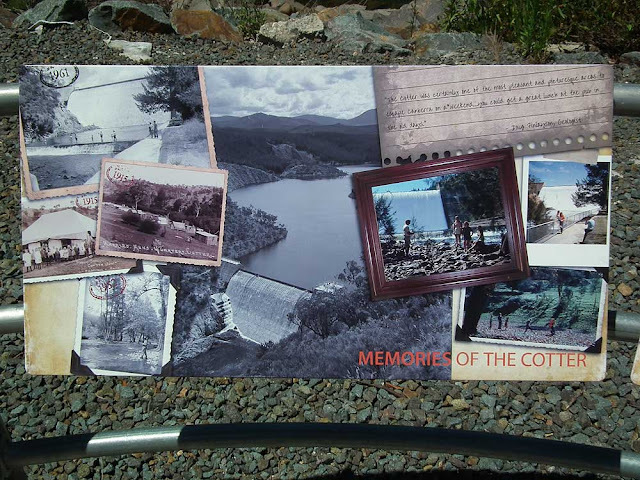 The original dam was built across the Cotter River in 1912, and a pumping station was completed in 1914. 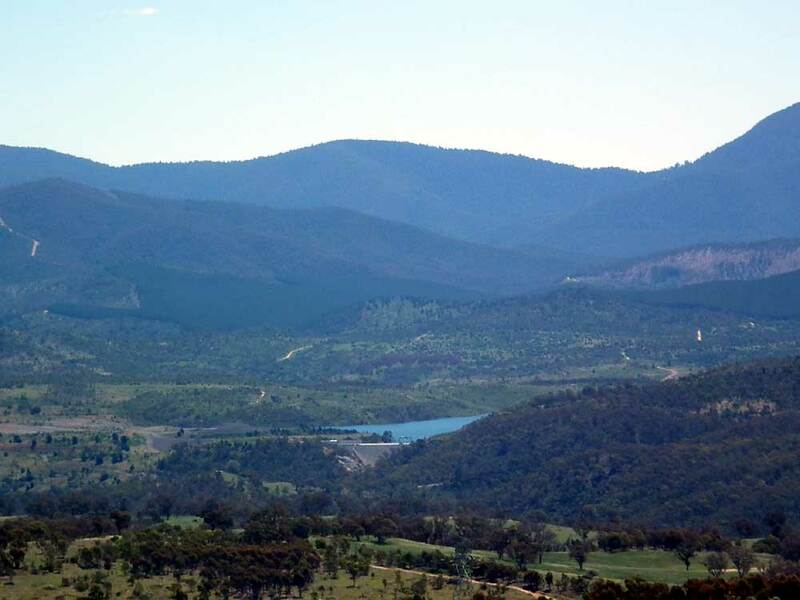 Water was pumped to a reservoir on Mount Stromlo, and from there was gravity fed to another reservoir (Red Hill) before being piped (gravity again...) into Canberra homes. In the late 60's other dams were built higher up the Cotter River which in normal years removed the need for the Cotter dam, but it was held in reserve for very dry years. 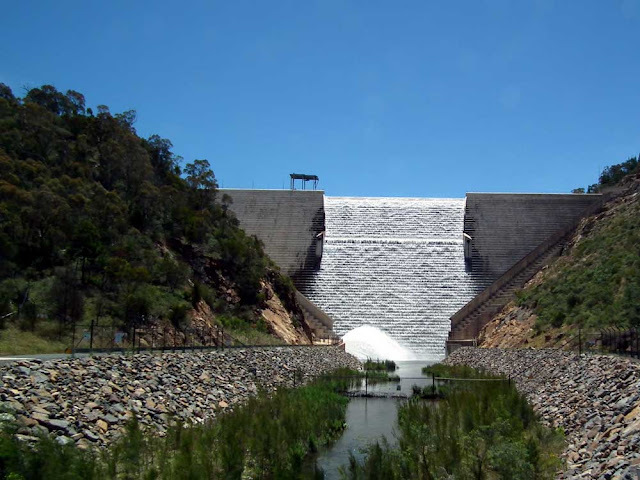 About 10 years ago it was decided that Canberra was still under-resourced when it came to water, so a new dam was built across the Cotter 100metres downstream of the old dam. The new dam is 87 metres high compared to the 31metres of the old dam, and holds twenty times the amount of water. The old dam (which is heritage listed) remains in place, invisible except in the dryest of years. 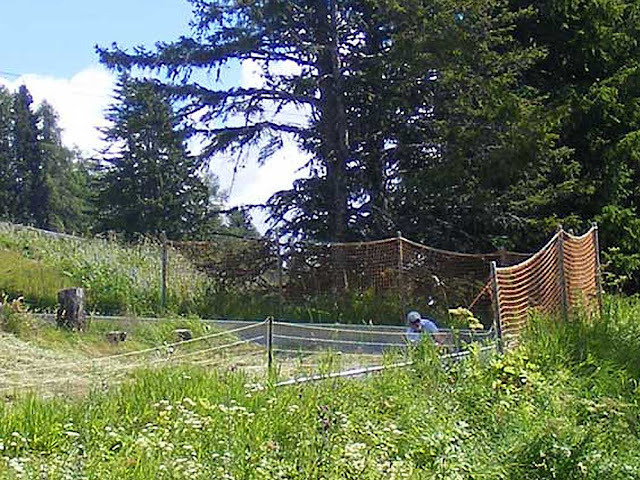 It serves as a silt trap, stopping soil build up against the new dam wall. 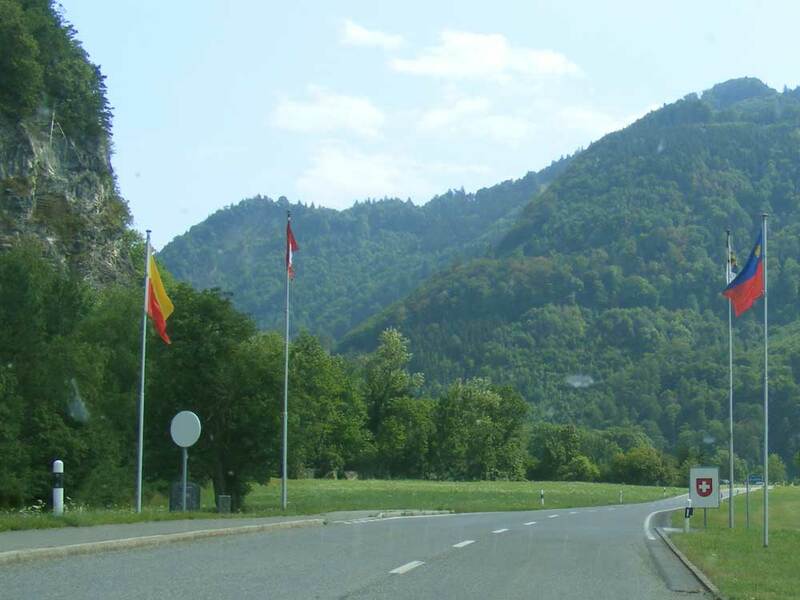 When we drove to Switzerland we didn't drive the easy way - we went via Germany, Austria and Liechtenstein, entering Swizerland via the St. Luzisteig Pass. 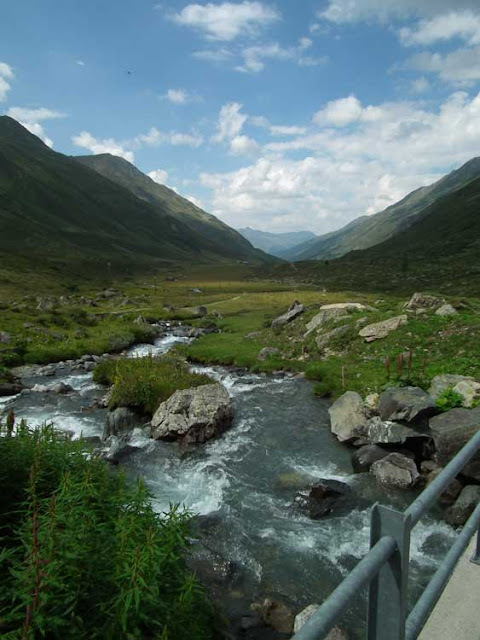 The pass has long been a problem for communities at either end, so it has been constantly fortified and re-fortified, the lastest fort replacing one destroyed by the Austrians in 1622. 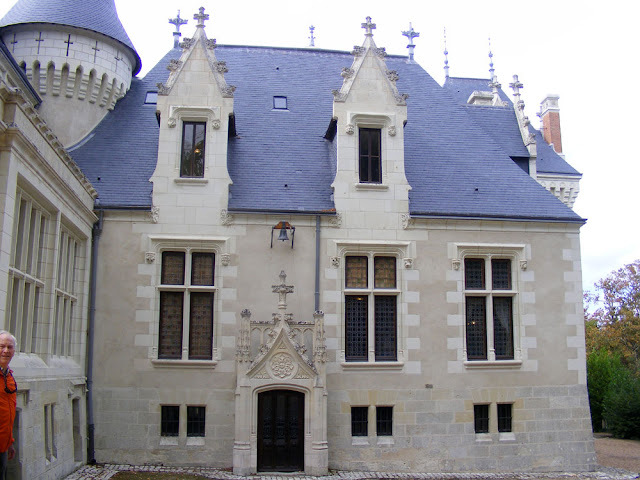 The gate house of 1705 still exists, although most of the fortifications date from 1831. 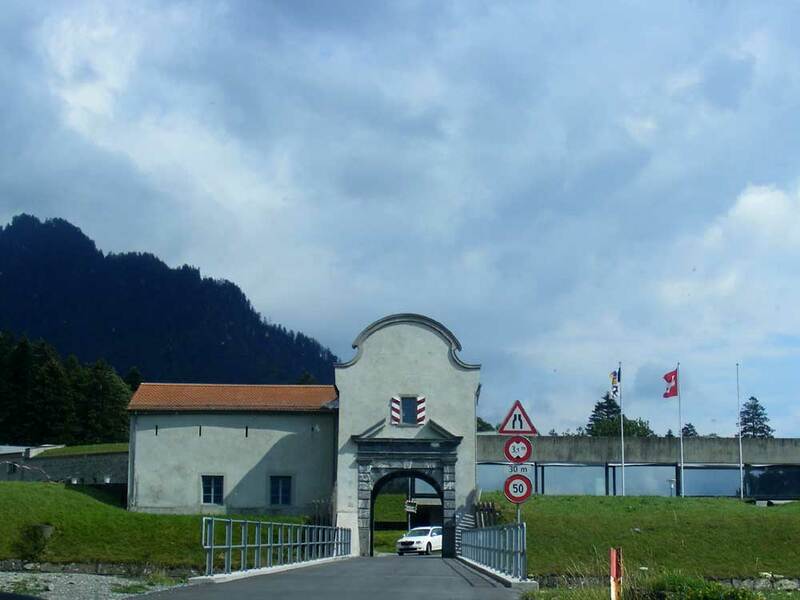 Until 2004 the fort was a Swiss army base, training cavalry troops. It now houses a military museum. When we were in Mulhouse we visited the motor museum, and they were holding their "Vehicles in Uniform" open day. 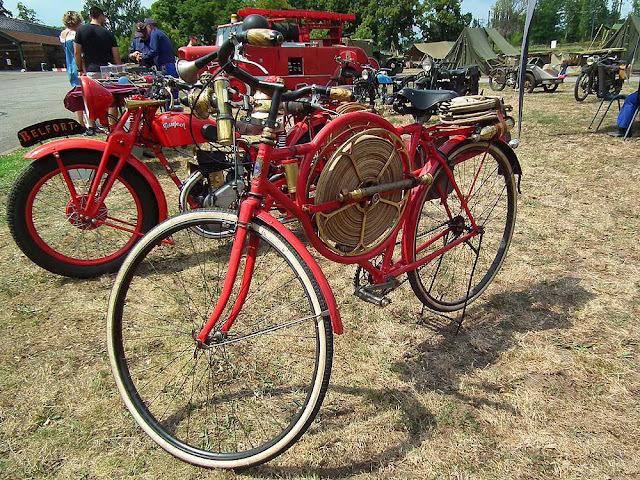 One of the more intriguing (and probably most weirdly stylish) pieces of equipment was this pompier's (fireman's) bicycle from the early years of the 20th century. 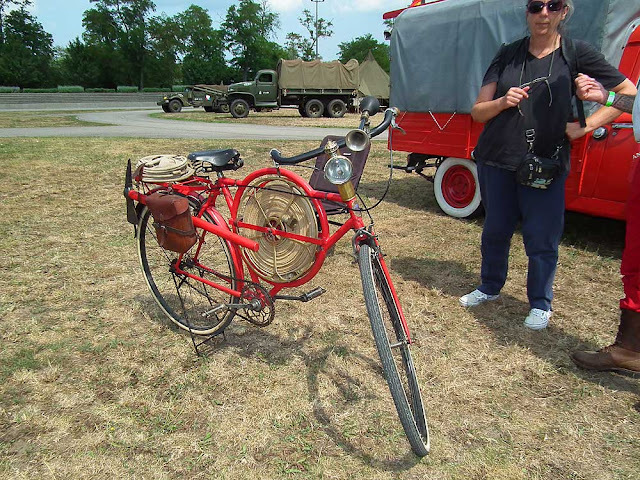 We can find very little information online, but from conversation with its owner we discovered that they were used in either in small villages that didn't have a larger brigade, or as a first response machine where larger machines couldn't go. 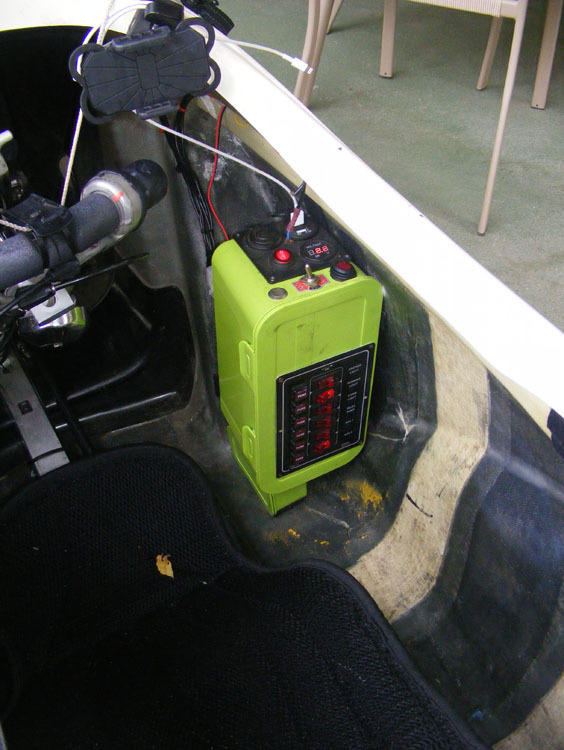 It carries all one needs for putting out a small fire, or at least keeping it at bay until reinforcements arrive. I can't remember exactly (and don't have photos that show it accurately enough) but I am fairly sure the brown canvas item on the back rack is a bucket. According to the owner the most important tool was the axe. It allowed the fireman to break down a door if necessary to rescue victims. Even if he couldn't put the fire out he could ensure nobody died. We were particularly taken by its "siren", and also by its gas headlight. I love old industrial buildings, especially when they show some kind of style. This is the Cooperative de Vente des Associations Agricole de Loir et Cher warehouse that stands by the station in Onzain. It now appears to be abandoned and unloved, but I hope some use can be found for it so that the evocative 1930's script isn't lost. At least, that's what I thinks it's called! One day while we were in Switzerland Susan and I drove up to Berggasthaus Dürrboden. Not that we were aware that's what we were doing, I was just following a road to see where it went, hoping it would lead to a post-lunch coffee. It was a very successful coffee search, given extra value by some amazing scenery. And cows with bells. To be brutally honest, it wasn't the best coffee I have ever had. In fact, it may have been instant. At least I had two cups.... because Susan got linguistically challenged and ordered "drei kaffe" because drei sounds like two. Why couldn't she make that mistake when ordering ice-cream? 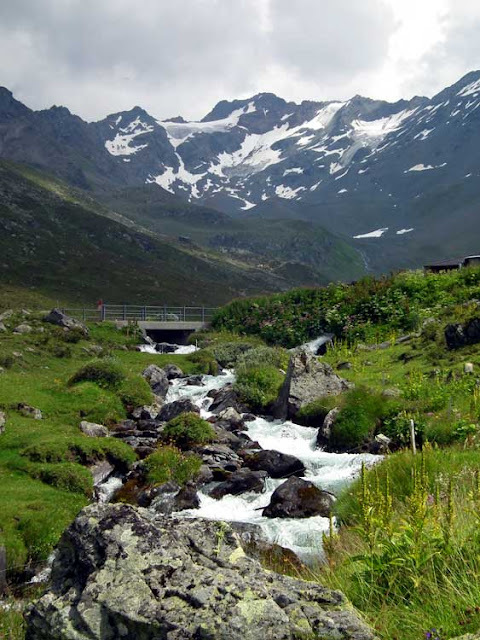 Looking down the valley towards Davos. We haven't posted any photos of Preuilly sur Claise lately. Then I noticed that last month I had taken this shot of the Abbey Church. Last week we were away working, but training didn't cease. We were in a hotel on a golf course which has a 10 metres pool, so both walking and swimming were possible. Even with reduced opportunity we managed 27km of walking and just over 2km of swimming. 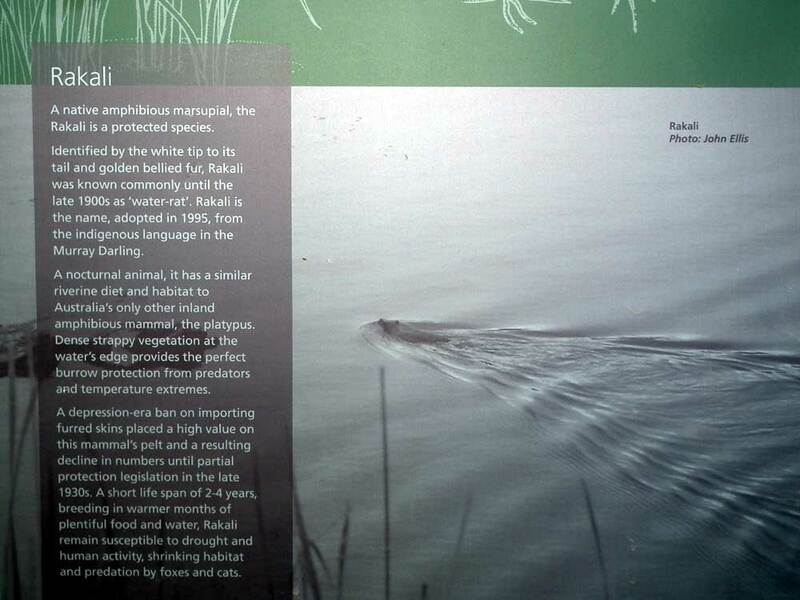 I've never seen a Rakali (previously the Australian Water Rat). I wouldn't be surprised if the person who took this photo hadn't either. 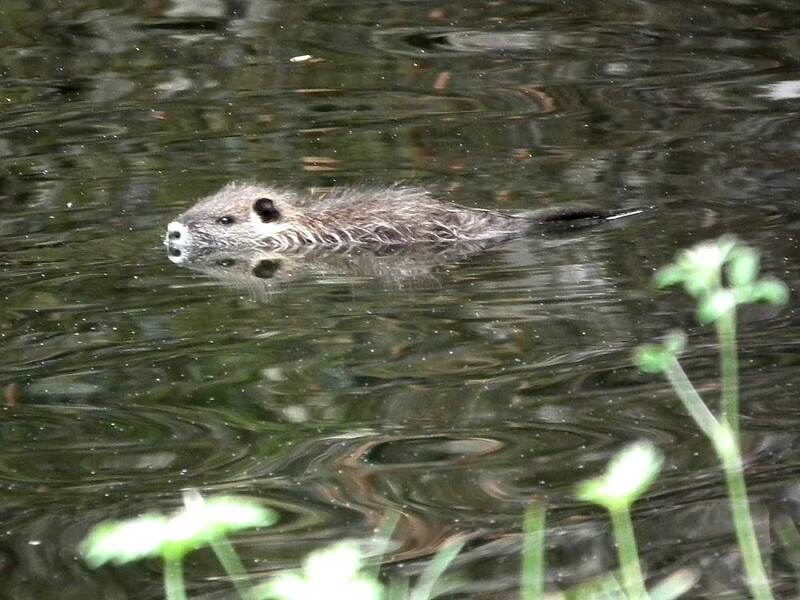 In their defence, it's a nocturnal amphibious wild animal, so you probably don't get to see many. We didn't have a blog post yesterday, our 5 days of work ending Thursday became 6 days ending Friday, and we were exhausted.